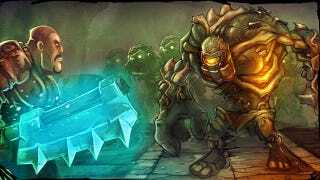 The creators of action-role-playing game Armed Heroes Online have denied allegations that they ripped off Torchlight's art assets, taking to the Touch Arcade forums today to call the claims "untenable." Over the weekend, Runic Games President Travis Baldree pointed out that Armed Heroes Online had stolen a large number of art assets from his company's action-RPG Torchlight, posting an art montage (below) as proof. He also unzipped sound effect files from the game and said they shared the same names as many of the files in Torchlight. But in a post this afternoon, a Touch Arcade user named Serena Zhang who says she is from Armed Heroes developer EGLS said they'd "never straightly stole assets from Torchlight," claiming they drew inspiration from World of Warcraft and other games. As proof, she posted several Armed Heroes images lined up next to character models from Torchlight. She also pointed to similarities between skills in Torchlight and Diablo II, saying Runic drew inspiration from other games too. "We sincerely hope that Mr. Travis Baldree can note that the similarity between Armed Heroes and Torchlight may be due to that we both learn from Blizzard, unless you are suggesting that except you the rest must not learn these advanced skills from Blizzard who has long been one of the great leaders within the industry," Zhang wrote. "Moreover, if anyone has ever pay attention to games of similar themes, he or she should have found that there are always several games of same type compete with and learn from each other's game designs, functions and other settings." But Baldree says Armed Heroes directly took assets from Torchlight, and indeed, the above image makes that seem pretty clear. In a response to Zhang, Baldree posted two more comparison images. "I have no problem with inspiration," he wrote. "We are obviously inspired by Diablo, and make no bones about it. But we don't include any Diablo artwork or sounds in our game. "Posting pictures of random models with no association isn't much of a defense, I'm sorry. Twiddling the geometry a little bit and doing minor texture alterations doesn't equate to original artwork or even artwork 'inspired by.'"